Bagrati Cathedralis an 11th-century cathedral in the city of Kutaisi, in the Imereti region of Georgia. A masterpiece of the medieval Georgian architecture, the cathedral suffered heavy damage throughout centuries and was reconstructed to its present state through a gradual process starting in the 1950s, with major conservation works concluding in 2012. A distinct landmark in the scenery of central Kutaisi, the cathedral rests on the Ukimerioni Hill. Bagrati Cathedral was built in the early years of the 11th century, during the reign of King Bagrat III, due to which it was called “Bagrati”. in 1994 Bagrati Cathedral, together with the Gelati Monastery, was included in UNESCO’s World Heritage Site list as a single entity. In 2001, ownership of the cathedral was transferred from the Georgian state to the Georgian Orthodox Church. It is presently of limited use for religious services, but attracts many pilgrims and tourists. It is also frequently used as a symbol of the city of Kutaisi, being one of its main tourist attractions. Gelati is a medieval monastic complex near Kutaisi, in the Imereti region of western Georgia. A masterpiece of the Georgian Golden Age, Gelati was founded in 1106 by King David IV of Georgia and is recognized by UNESCO as a World Heritage Site. Historically, Gelati was one of the main cultural and intellectual centers in Georgia. It had an Academy which employed some of the most celebrated Georgian scientists, theologians and philosophers, many of whom had previously been active at various orthodox monasteries abroad, such as the Mangana Monastery in Constantinople. Among the religious authors were celebrated scholars as Ioane Petritsi and Arsen Ikaltoeli. Due to the extensive work carried out by the Gelati Academy, people of the time called it “a new Hellas” and “a second Athos”. The Gelati Monastery has preserved a great number of murals and manuscripts dating back to the 12th to 17th centuries. Gelati is the burial site of its founder and one of the greatest Georgian kings David IV. It is a small and very beautiful monastery with round turrets crowned with peaked tent-shaped domes. The monastery is standing above the rough Rioni river and is buried in coastal vegetation. 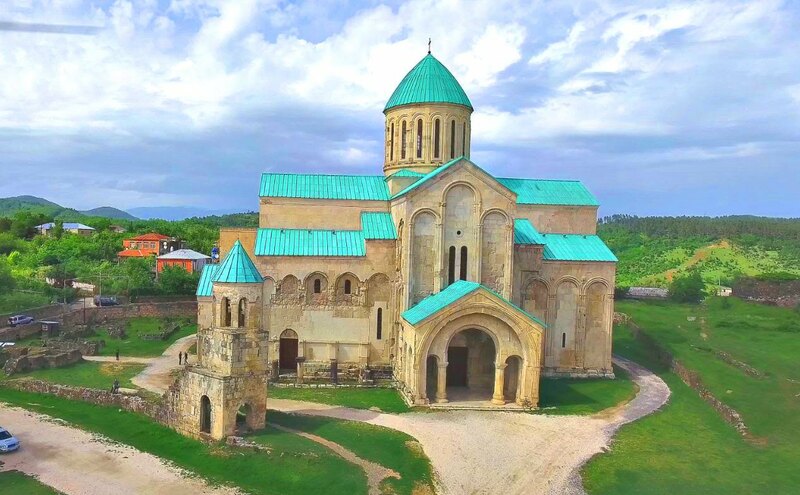 According to the legend the monastery was constructed on the place where Muslim aggressors executed David and Konstantin Mkheidze, Georgian princes, who refused to accept Islam. In a small monastery hall on an eminence there is a big rectangular ark with the hallows of the pious princes canonized by Georgian Church . Motsameta attracts crowds of tourists with an ancient superstition: if one crawls three times under the ark and makes a wish while touching the hallows, the princes David and Konstantin will grant it. The king Bagrat III reconstructed the church in the 10 th century. The building was reconstructed again in the 19 th century. Prometheus Cave is one of Georgia’s natural wonders and one of the largest in the world and has many underground rivers. It was discovered in 1984. Its unique features include a variety of halls and landscape diversity. Four distinct layers were formed during different stages of the Earth’s development and tourists are able to journey through the historic territory by foot or in boats. 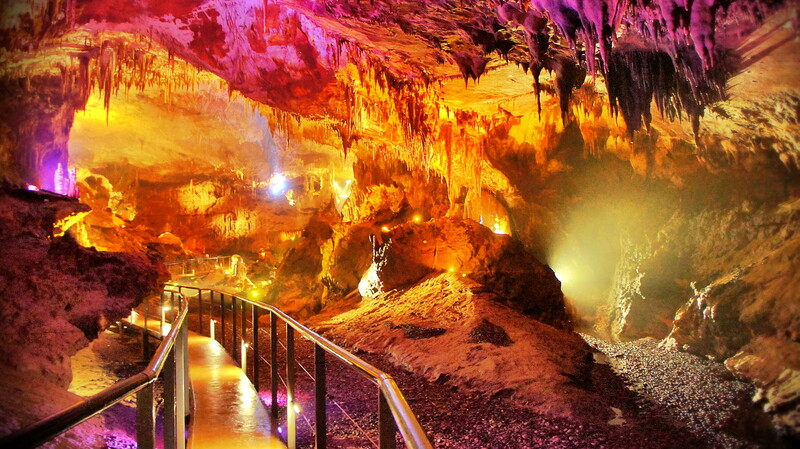 Prometheus Cave is one of the most popular international tourist caves, and includes various types of stalactites, stalagmites, curtains, petrified waterfalls, cave pearls, underground rivers, and lakes. The cluster of six caves differs significantly from each other in scale and the unique shapes of petrified flow stones found within.